I really don’t know why I don’t see more natal plums in our landscapes around here. Natal plums are really easy to grow and don’t require much care at all to look great all year round. 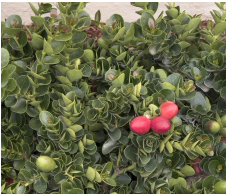 The Tomlinson variety of natal plum is a dwarf, evergreen shrub that will spread slowly to 2 feet tall and 3 feet wide. And, it grows best in Zones 9a – 11, that’s us! This shrub performs well in full sun and with regular watering initially (especially in the extreme heat). Over time, this shrub will become quite drought resistant in your landscape; easily withstanding radiant heat from patios or driveways. It’s an excellent choice for a container planting too. Natal plums can adapt to many different soil types given good drainage. 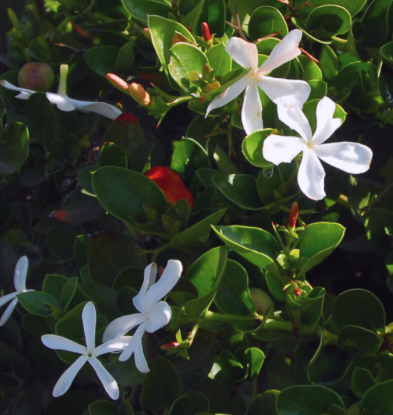 Because they are so tolerant of a variety of growing conditions, these plants are great for coastal plantings; their thick leaves protect them from harsh conditions. This shrub will need to be protected in hard freezes. Fragrant white blooms will appear heavily in spring and the shrub will bloom intermittently through the fall. The flowers will produce small fruit that start out green and turn a deep, wine-red when ripe. These fruit are edible and can be enjoyed fresh or in pies or jellies. There are thorns on natal plums, but they are small and tucked tightly into the dense arrangement of leaves. I guess that’s what I love most about Tomlinson natal plums – the foliage is a beautiful glossy green and the arrangement of leaves on stems is just so attractive. 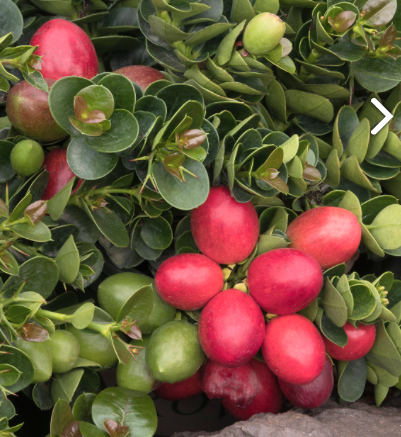 So, if you are looking for an easy addition to your full-sun landscape, consider a natal plum. You won’t be disappointed. Crimson Fire is a dwarf Loropetalum growing to 2-3 feet in height. The burgundy-red foliage is a beautiful contrast to the stunning, fragrant, hot pink fringe flowers which are all over the plant in spring. New growth in spring emerges ruby red maturing to burgundy with a purple tint. This is easy to grow and a well-behaved shrub. It’s compact, spreading habit and foliage color and texture make Crimson Fire an excellent choice for: Mass Plantings, Small Groupings, Flowering Shrub Borders, Low Hedges, Home Foundation Plantings, Erosion Control on Slopes and Embankments, Container Gardens, Asian Theme Gardens, and as a Groundcover. Crimson Fire Loropetalum does best in full sun to partial shade. It prefers to grow in well-drained but moist soils with a strong preference for rich, acidic soils. During the first season, water enough to keep soil moist but not constantly soggy. No pruning necessary however responds well to it. This genus was classified by Robert Brown (1773-1858) of Great Britain in the mid 19th century.. He named it from the Greek loros for Strap, and ptalum for petal. This is the only cultivated species in the entire genus and is native to a large part of southeast China, the Himalayas and Japan. The first purple leaf species were not discovered in the Hunan Province until 1942. This species was originally named by D. Brown as part of the closely related whitchhazels. Ligularias are known by many interchangeable names. Leopard Plant, Ragwort and Golden Groundsel to name only a few. They are unusual, old world perennials with big leaves with long leaf stalks and unique daisy-like flowers. or along the banks of stream or pond. The ideal location for growing most Ligularias is in a bog garden with fertile, humus-rich soil in partial shade. In areas with hot summers, they will need partial to full shade. Most Ligularias require constantly moist soil. ReBLOOM™ Azaleas Deliver Color in Three Seasons! Experience a remarkable new series of evergreen, disease resistant, reblooming azaleas that feature large flowers that appear in spring, then rebloom in summer, and continue blooming until hard frost. Even high summer temperatures won’t stop this beauty from producing loads of late summer and fall flowers. What’s more, these new azaleas offer better cold hardiness, withstanding temperatures 0 to -10 degrees F (USDA Zone 6). They also offer a wider range of distinctive colors and large, double and even triple-petal flowers that provide big landscape impact. ReBLOOM™ Azaleas stay compact due to the self-pruning nature of the continual flushes of bloom that promote branching. After being inspired and mentored by many notable azalea enthusiasts, breeder Bob Head began developing ReBLOOM™ Azaleas. About 15 years ago, he saw an opportunity for improvement on what was currently available in the marketplace. He started out planting 80,000 seedlings and then narrowed the selection down to about 200 plants from which these 9 were selected. ReBLOOM™ Azaleas are moderate growers, reaching maturity in 10 to 12 years. They will tolerate some sun, but thrive in partial shade. They perform best in moist, fertile, highly organic and well-drained soil that is slightly acidic. Native soils higher than pH 7.0 should be amended with organic matter. If you have ever walked past the League City Library on an early spring day, you are familiar with the wonderful fragrance and beauty of antique roses. These gorgeous red and pink stars of the garden are in bloom year round and are a testament to how hardy antique roses can be. They thrive in our hot Texas summer heat and sometimes drought like conditions. Antique roses have a fragrant old fashioned rose smell that is absent from the modern hybrid tea roses. There are several different types of antique roses. Some do better in our zone 9 climate and humidity than others. The roses we carry at Maas are especially suited for our area. Most of our antique roses come from the Antique Rose Emporium in Brenham, Texas. There are 3 groups of rose titles at the Emporium. All of the roses are classified as old roses. Old or antique roses are defined as rose varieties that were introduced prior to 1867. Antique roses can also be defined as roses that have been in cultivation for at least 75 years and that have old rose qualities such as flower form, color, and fragrance. Some of the antique roses have the EarthKind designation. EarthKind roses are screened by the Texas Agrilife Service through Texas A & M University. These roses are selected for their durability and ease of care. They go through a rigorous testing program before they are rewarded the EarthKind label. Texas Pioneer Roses are roses that have been rescued by the Texas Rose Rustlers.These rose enthusiasts have traveled Texas taking cuttings from abandoned old homesteads and cemeteries. These roses have survived on their own with no care for years proving their toughness. Antique roses are in these classes: Gallicas, Musks, Centifolias, Damasks, Chinas and Teas. Crosses of these classes of roses produced other antiques such as the Noisettes, Bourbons, Portlands, Hybrid Perpetuals, Polyanthus and Hybrid Musks. Further crosses produce the more modern but still antique Old Hybrid teas, Floribundas, and Grandifloras. All of these rose types vary in form, size and appearance. Antique roses can be 2 to 3 feet tall to over 20 feet tall. They can be small to very large shrubs, climbers or ramblers. Antique rose colors tend to be muted or pastel. There are some vibrant pink, red or yellow colored blooms. The soft colors of antique roses blend well with any type of garden. All antique roses have a fragrance although some are stronger than others. Caring for your antique rose is very easy. Roses need at least 6 hours of direct sunlight. They need well draining acidic soil and regular watering when first planted. Plant your roses above soil level as explained in the Maas Planting Guide. If you do not have one of these guides ask for it at your next visit to our store. Mulch is the secret to happy roses. Mulch your roses to 2 to 3 inches deep. This will keep the water in and the weeds out. Fertilize your roses every 6 to 8 weeks during their bloom period with a good organic fertilizer for acid loving plants. When first planted, water roses regularly. A good, deep watering 2 to 3 times a week is preferable to watering shallowly every day. Deep watering promotes deep root growth and helps with good drought tolerance. In February around Valentine’s Day cut your roses back to your desired height. Roses benefit from a good pruning. I prune my roses in August also. This promotes a fresh flush of fall blooms. Now, sit back, relax and enjoy your beautiful blooms and the fantastic fragrance of these old fashioned roses.They are definitely my favorite flower of my garden. The information found in the following table has been compiled from various growers’ websites. Most of the bamboo cultivars we offer are clumping (C) and are non-invasive. Running bamboo (R) can be invasive if not contained by an underground barrier. Dwarf (D) and giant (G) varieties are indicated. Bambusa glaucenscens aka Bambusa multiplex C 20-30’ Great for hedges or tall screens. Attractive stems are brilliantly striped green on yellow with new growth pinkish and green. As a hedge can be maintained at 8 to 10 ft. tall with occasional pruning. Non-invasive. Evergreen. Hardy to 18°F Follow a regular watering schedule during the first growing season to establish a deep, extensive root system. Watering can be reduced after establishment to weekly (more often during extreme heat.) Feed with a general purpose fertilizer like Microlife before new growth begins in spring. Bambusa eutuldoides ‘Viridi Vittata’ C Up to 25’ Bright yellow culms accented by bold green stripes. 1” diameter culms contrast nicely with dark green leaves. New culms have pink/peach tones. Hardy to 21°F. Very versatile, tough. Great for screening. Follow a regular watering schedule during the first growing season to establish a deep, extensive root system. Watering can be reduced after establishment to weekly (more often during extreme heat.) Feed with a general purpose fertilizer like Microlife before new growth begins in spring. Bambusa lako C/G > 40’ Thick, black culms, with some thin, green striping. Large tropical leaves begin 1/3 to ½ way up the culm. Upright growth with fairly open clump. Slow grower. Hardy to 25°F. Prefers moist soil. Full to partial sun. Bambusa ventricosa C/D 3-6’, contained. Otherwise, up to 45’. Excellent bamboo for screens, windbreaks, or containers. Stays dwarf and produces the swollen stems that give it its name only when confined in tubs or grown in poor soil. Evergreen clumping type. Hardy to 18°F. Follow a regular watering schedule during the first growing season to establish a deep, extensive root system. Watering can be reduced after establishment to weekly (more often during extreme heat.) Feed with a general purpose fertilizer like Microlife before new growth begins in spring. GIANT BLUE Borinda boliana C/G Up to 20’ in 10 years. >35’ Fast grower. Hardy to 10°F. Feathery green leaves and gracefully arching canes have new shoots that are pale blue in color. Excellent hedge or screen. Adaptable to most soil types; prefers humus-rich, well drained soil. 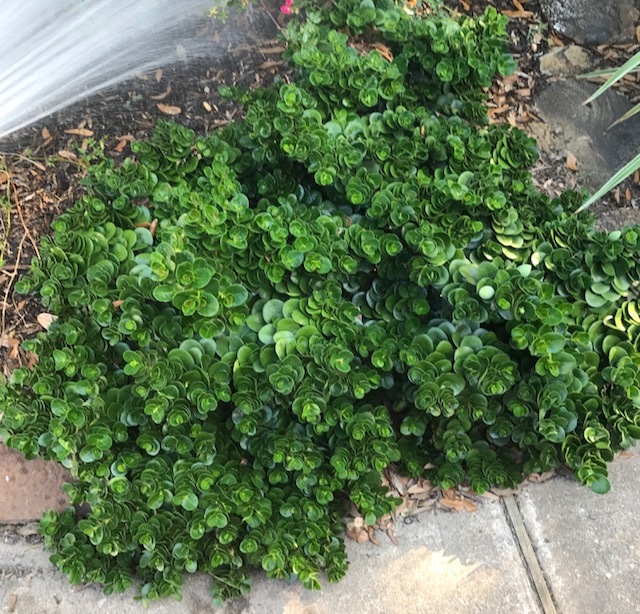 Needs weekly watering after establishment (more often in extreme heat). Best with some afternoon shade in hot summer climates. Feed with a general purpose fertilizer like Microlife before new growth begins in spring. GIANT LEAF Indocalamus tessalatus R/D 5-8’ Hardy to -10°F. Forms mound of 24×4” leaves. Great for erosion control, screening. Adapts well to shade. Prefers loose, loamy soil. Water often enough and deeply enough to keep soil moist. Barrier should be installed to prevent spreading. GIANT TIMBER aka OLDHAM’S Bambusa oldhamii C/G Up to 65’ Hardy to 20°F. 4” diameter culms. Short branches with long leaves. Fast grower. Small footprint allows great use of horizontal space in urban landscapes. Full to partial sun. Keep well mulched and watered. General purpose fertilizer like Microlife twice per year. GOLDEN GODDESS Bambusa multiplex ‘Golden Goddess’ C 6-10’ Perfect for smaller gardens, Golden Goddess has a well-mannered clumping form that can be easily maintained at under 8 ft. tall. Fantastic container or screen plant. Graceful, arching form for exotic tropical or Asian effect. Non-invasive. Evergreen. Hardy to 15°F. Follow a regular watering schedule during the first growing season to establish a deep, extensive root system. Watering can be reduced after establishment to weekly (more often during extreme heat.) Feed with a general purpose fertilizer like Microlife before new growth begins in spring. GOLDEN HAWAIIAN Bambusa vulgaris C 25-35’ Staggered green and golden-colored culms. This large ornamental bamboo is highly attractive. Makes a great pot plant and does extremely well in interiors. The size and beauty of this plant makes it look unreal. Fast grower. Hardy to 25°F. Follow a regular watering schedule during the first growing season to establish a deep, extensive root system. Watering can be reduced after establishment to weekly (more often during extreme heat.) Feed with a general purpose fertilizer like Microlife before new growth begins in spring. GRACEFUL Bambusa textilis gracilis C Up to 30’ Forms a lovely vase-shaped plant and makes an excellent screen. Tips of culms gracefully arch outward, making this plant one of the most elegant species of bamboo. Can flush up to 3 times a year. Hardy to 15°F. Follow a regular watering schedule during the first growing season to establish a deep, extensive root system. Watering can be reduced after establishment to weekly (more often during extreme heat.) Feed with a general purpose fertilizer like Microlife before new growth begins in spring. HENON or GIANT GREY Phyllostachys nigra ‘Henon’ R/G Up to 50’ Green culmed timber bamboo. Culm diameter 4”. Ages to an olive grey color. Hardy to -5°F. Vigorous grower with feather-like leaf pattern. Barrier recommended. Follow a regular watering schedule during the first growing season to establish a deep, extensive root system. Watering can be reduced after establishment to weekly (more often during extreme heat.) Feed with a general purpose fertilizer like Microlife before new growth begins in spring. Otatea acuminata ‘Aztecorum’ C 15-20’ Long, narrow leaves give overall lacy look. Drought tolerant when established. Grown easily in pots. Fast Grower. Great windbreak. Hardy to 22°F. Follow a regular watering schedule during the first growing season to establish a deep, extensive root system. Watering can be reduced after establishment. Feed with a general purpose fertilizer like Microlife before new growth begins in spring. Partial to full sun. SICHUAN Borinda angustissima C 16-18’ A rare plant species valued for its delicate foliage and its extremely narrow, clumping growth habit, developing a vase shape as it matures. Tolerant of heat, cold and drought. Fast grower. Hardy to 15°F. Follow a regular watering schedule during the first growing season to establish a deep, extensive root system. Water more often in extreme heat. Watering can be reduced after establishment. Feed with a general purpose fertilizer like Microlife before new growth begins in spring. Part sun to shade. PAINTED BUDDHA BELLY Bambusa ventricosa ‘Kimmei’ C/G >40’ This beautiful form of Buddha Belly bamboo has culms that emerge green and soon turn a beautiful golden-yellow with green stripes. It has two forms, a dwarf with bulging internodes that are great for pots on patios or it can grow as a giant with large zig-zagging culms and straight slender, given ideal condition. Sometimes the dwarf form is encouraged by lack of water, planting it in tight spaces, or growing in a container. This bamboo is best as a container plant where with proper care and pruning it can be a delightful specimen. Hardy to 18°F. Follow a regular watering schedule during the first growing season to establish a deep, extensive root system. Watering can be reduced after establishment to weekly (more often during extreme heat.) Feed with a general purpose fertilizer like Microlife before new growth begins in spring. PUNTING POLE Bambusa tuldoides C/G >40 Fast grower. Thick, rigid stems (2 inches across at the base.) Dense tall screen, excellent for privacy or windbreak. Evergreen. Hardy to 15°F. Follow a regular watering schedule during the first growing season to establish a deep, extensive root system. Watering can be reduced after establishment to weekly (more often during extreme heat.) Feed with a general purpose fertilizer like Microlife before new growth begins in spring. ROYAL aka WONG CHUK Bambusa textilis ‘Kanapaha’ C/G Up to 50’ Moderate grower. Hardy to 18°F. White powdery bloom on culms. Culm diameter is 2.5”. Small leaves with long internodes. Full to partial sun. Well-drained, moist soil. SEABREEZE Bambusa malingensis C >40’ Extremely fast growing, tough and bushy. Non-invasive. Tolerant of drought, salt and flood. Hardy to 20°F. Slender branches with small leaves. Can be kept small. Culms are 2.5” diameter. Follow a regular watering schedule during the first growing season to establish a deep, extensive root system. Watering can be reduced after establishment to weekly (more often during extreme heat.) Feed with a general purpose fertilizer like Microlife before new growth begins in spring. SUNBURST Bambusa pervariabilis ‘Viridistriata’ C >40’ Similar to Asian Lemon but taller with larger diameter culms. Hardy to 25°F. Full to partial sun. Well-drained, moist soil. SUNSET GLOW Fargesia rufa C Up to 8’ Orange-red sheaths at each node add color to the green culms. Perfect specimen for smaller gardens and courtyards. Leaves do not curl in the sun as with some bamboos. Non-invasive. Evergreen. Hardy to -15°F Follow a regular watering schedule during the first growing season to establish a deep, extensive root system. Watering can be reduced after establishment to weekly (more often during extreme heat.) Feed with a general purpose fertilizer like Microlife before new growth begins in spring. WEAVERS Bambusa textilis ‘Maculata’ C 20-30’ Delicate in appearance. Smooth, thin culms arch when heavy after rain. White powdery bloom at nodes. Long internodes, small leaves. Hardy to 20°F. Evergreen. Full to partial sun. Well-drained, moist soil. Sasaella masamuneana ‘Albostriata’ R/D 3-5’ Attractive striped foliage on low, dense clumps. Perfect for low border or groundcover; nice in rock gardens and used as erosion control. Fast grower. Spreads with underground stems. Can be invasive if not contained. Evergreen. Hardy to 5°F. Follow a regular watering schedule during the first growing season to establish a deep, extensive root system. Watering can be reduced after establishment to weekly (more often during extreme heat.) Feed with a general purpose fertilizer like Microlife before new growth begins in spring. Pyracantha is a wonderful shrub for barriers, fence lines and anywhere that a dense and thorny bush is needed in a landscape. The flowers attract bees and other nectar feeders in droves. It can grow up to 10′ -12′ tall and wide. It’s a hardy shrub able to handle dry and clay heavy soils so long as it does not water log. It can grow in full sun to partial shade and has very few illnesses. The two most common being fire blight and pyrantha scab. Both of which are easily treated should they occur. The lovely masses of leaves, white flowers and Christmas berries make Pyracantha an all around stunning addition to any landscape.